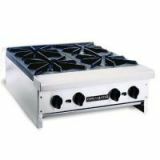 Standard Features : Stainless steel front and sides. Heavy gauge chassis. Two piece lift off burners, rated at 32,000 BTU/hr each. Individual S/S non clog pilots for instant ignition for each burner. 12"x12" sectional cast Iron top grates. Manual gas control valve for each burner. Optional 4" legs or equipment stands available. Removable drip pan for easy cleaning. Compact design for counter top use. AGA and CGA design certified, NSF Listed. One year limited warranty, parts and labor.